by Fields, Marjorie V.; Meritt, Patricia A.; Fields, Deborah M.
Note: This is the bound book only and does not include access to the Enhanced Pearson eText. To order the Enhanced Pearson eText packaged with a bound book, 0134300807. Positive approaches focused on treating the causes of behavior problems to help young children become happy, responsible, productive people. 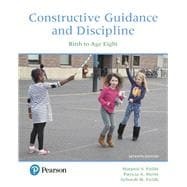 This book presents guidance and discipline concepts within a framework of child development, developmentally appropriate practices, and constructivist education to give early childhood educators the best approaches available for nurturing children for success. Focusing on what is best for young children, rather than merely presenting an impartial overview of various approaches, the authors stress helping adults to effectively assist children’s moral development using the coercive approaches of punishment or behavior modification. The emphasis is on guidance for children ages three through eight. The new edition continues the features that made previous editions so popular. Included are new Invitations to Reflection, tables and figures, careful documentation and careful explanations of the principles, and a stronger balance of preschool and primary-grade level examples, while also including examples with infants and toddlers, addresses the needs expressed by higher education programs that address guidance for young children from birth to age eight. Marjorie Fields has recently retired after teaching in the field of early childhood education for more than 30 years. She first taught kindergarten, then first grade, and then began teaching teachers. Thanks to her own children, she also had experience in cooperative preschools and various types of childcare. Marjorie has a Doctorate in Early Childhood Education with Research in Parent Involvement. She has been active in early childhood professional organizations at the national and local levels; she recently served as president of the National Association of Early Childhood Teacher Educators (NAECTE) and has served as vice president of that association. She has served on the national governing board for the National Association for the Education of Young Children (NAEYC). She has published extensively in the field of emergent literacy, including the textbook Let’s Begin Reading Right (Merrill/Prentice Hall), as well as in the field of child guidance. This book is the result of more than 30 years of reading and thinking in conjunction with developing and teaching early childhood discipline courses. Dr. Fields credits her two sons with initially helping her learn what is most important about child guidance and discipline. She now continues to learn from her grandchildren, their parents and their teachers. Patty Meritt currently serves as a Professor of Early Childhood Education for the University of Alaska in Fairbanks, where she has been repeatedly nominated as teacher of the year. She has taught Child Guidance in several formats including workshops, as a full course on the web, as an intensive, compressed course as well as face-to-face instruction. Although she came on as an author for the sixth edition, Patty used the book for several earlier editions and says the book is the backbone of every guidance course she teaches. In addition to teaching at the university, Patty began her career as a college student in a parent coop, went on to work as a classroom teacher, before opening a private preschool. Later she took a position directing non-profit childcare and built the corporation into a multi-site, multi-million dollar business serving thousands of families, which required regularly using many of the skills discussed in this book! Patty’s academic degrees began with an AA in Nursery School and include a BA in Child Development and a Masters in Teaching. Her research has been primarily in the field of gender differences in early childhood. As a parent and now as a grandparent, she delights in continually learning, sharing and improving her respectful responses to all children. Deborah M. Fields is a Licensed Mental Health Counselor and the Director of Social Services for Agape Adoptions, an international adoption agency. She assesses and helps to prepare families who wish to adopt children internationally from a wide variety of countries. Debby also provides post adoption support services, assisting parents with the process of adjustment, attachment, and developing sensitive discipline practices. She is trained as a Trust Based Relational Intervention (TBRI) Practitioner, and enjoys seeing the powerful effect that loving, sensitive caregivers can have on children's healing and emotional development. Debby is also the mother of two teen daughters and continues to learn a great deal about emotional development in her family life. One of her children attends a cooperative public school where Debby enjoys working regularly in the classroom. Debby has a master’s degree in marriage, family, and child counseling. She was invited to present her master’s thesis on multicultural counseling at a national convention for the American Psychological Association. In addition to her training in attachment issues, she has focused on developing culturally sensitive practices in her work with children and families. She has also worked with teen-parents and in an elementary school counseling center.